"I've made this quick and colorful appetizer for many great dinner parties. Serve with fresh salsa, guacamole or sour cream as dipping sauces--or by itself. Works great on a large scale as well. Thawed and drained frozen veggies may be substituted for canned. 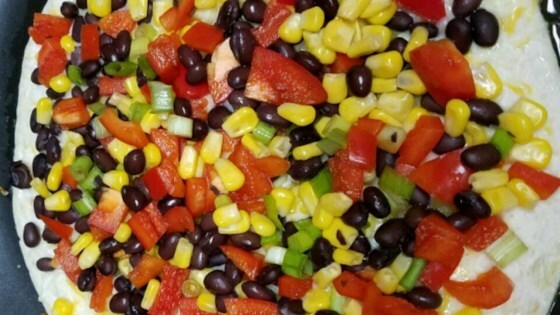 Look for the combination of corn, red pepper and black beans in the grocery store's frozen food section." Prepare a lightly oiled large skillet over medium heat. Place the tortilla in the skillet and flip it once to ensure an even coating of oil on both sides. Allow the tortilla to heat on one side for 1 minute. Beginning at the center of the tortilla, evenly spread the cheese blend until the tortilla's entire surface is covered. Top the cheese with corn, red bell pepper, black beans and green onion. When the cheese is completely melted, carefully slide the tortilla from the pan onto a cutting board. Slice into 8 wedges and serve warm. It was very quick and easy to make - only about 5 minutes per quesadilla - and you could customize the fillings! Can use black bean soup from the can and spread on the tortillas.